The Helix short shifter is the simplest MINI Cooper short shift kit in the MINI aftermarket. Competitor kits shorten the throw by using a short-stalk shift lever that forces you to have to reach down by your right knee to make shifts. The Helix kit, on the other hand, retains the proper shift knob position while providing the shortest throw possible. This kit comes with complete installation instructions and takes about an hour so install with jacks stands and mechanical tools. This kit is for manual cars only. 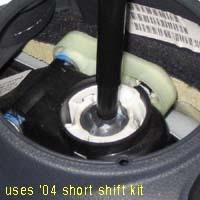 Midway through 2004, MINI changed the shifter lever. 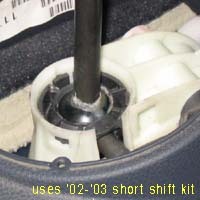 Because of this, you need to identify which MINI Cooper short shift kit is right for you. To do so, carefully pull the plastic ring (the bezel) at the bottom of the shifter boot straight up. It will pop off the console and four plastic tabs around the perimeter will be exposed. Look below the bezel at the plastic housing that holds the shifter rod in place with a ball socket. On an '02 or '03, much of the plastic linkage will be white, but where the metal shaft and ball enter the linkage the plastic will be grey. In '04 models, the housing will be grey and the ball socket will be white.